Vrnjacka Banja is a hot spring resort town located in south-central Serbia. The springs may be hot but the winter weather... anything but! As temperatures plunged below the freezing point last weekend, the town's resident roaming critters found themselves literally “out in the cold”. One particular chilly kitty had other ideas, according to Serbian website ALO. 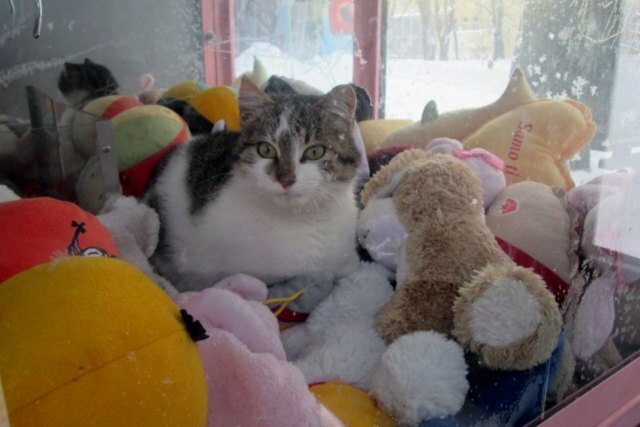 Having noticed what appeared to be a bunch of fellow critters cuddled together inside a big glass case outside a local movie theater, she decided to climb in with them. Brilliant! Getting into a claw-catcher machine was simple; clawing back, out on the other hand (er, paw), isn't: it takes a little luck AND a few dinar coins. Our featured creature may be lucky but is sorely lacking in loose change; not having any pockets to store such things. 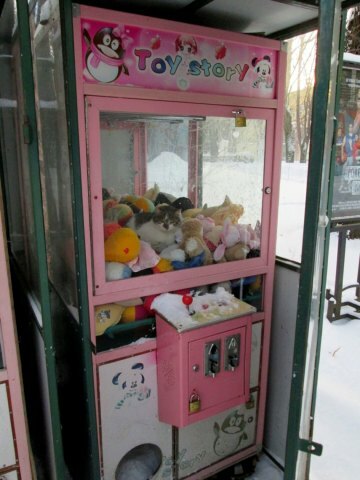 As daylight dawned and the townspeople of Vrnjacka Banja began to go about their business, word began to spread of a cat caught in a claw machine. A few folks who should know better even tried extricating the formerly frigid feline by inserting some dinar coins and playing the game... isn't it hard enough to win prizes that AREN'T moving? Thankfully, this story has a happy ending: someone alerted the long arm of the law, who quickly freed the no-doubt-embarrassed cat. Saved by the fuzz!